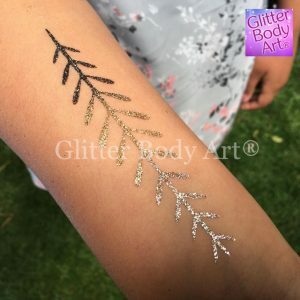 Our glitter tattoo stencils are supplied as 2 or 3 layered stencils, which are designed to be used with our range of cosmetic glitters and body adhesive. We also supply a range of temporary tattoo kits, face painting kits & accessories. If you buy over 4 packs of 5 stencils, you will receive a discount of 5p per pack. If you buy over 10 packs of 5 stencils, you will receive a discount of 10p per pack. Remove paper backing from rear of stencil – Place stencil onto desired area of skin – Remove clear top layer – Apply thin layer of body adhesive to the inside area of the stencil – Wait for the glue to become clear (opaque) – Apply glitter to the stencil using the small / medium brush – Use the large brush to remove excess glitter – Gently peel away the stencil to reveal your beautiful glitter tattoo.